Some games like to take their time and introduce you to their worlds and characters, doing the necessary legwork to draw you in and make you feel invested. Other games prefer to show you what they’re all about from the get-go, and Ape Out is definitely the latter. You begin in a cell. You break out. Your job is to make it across each procedurally generated maze while fending off attacking soldiers. This is the whole game – and it’s an utter delight. 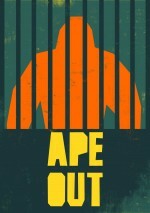 Ape Out is a great example of how to take a simple concept and flesh it out as much as possible. Your ape has multiple ways to defend himself, including attacking enemies by pushing them into walls (creating a messy splatter) or grabbing them and using them as human shields. The human shield method opens up several strategies as you navigate through corridors filled with soldiers. Every prisoner you take has a weapon they fire a few seconds after you grab them. You can use your prisoner as a typical human shield, letting them take a shot from a foe directly in front of you, and then rush that foe while they’re reloading. However, you can also dispose of that foe by simply letting your prisoner shoot them. Exploded enemies leave behind legs and torsos you can use to stun enemies in order to make an escape. 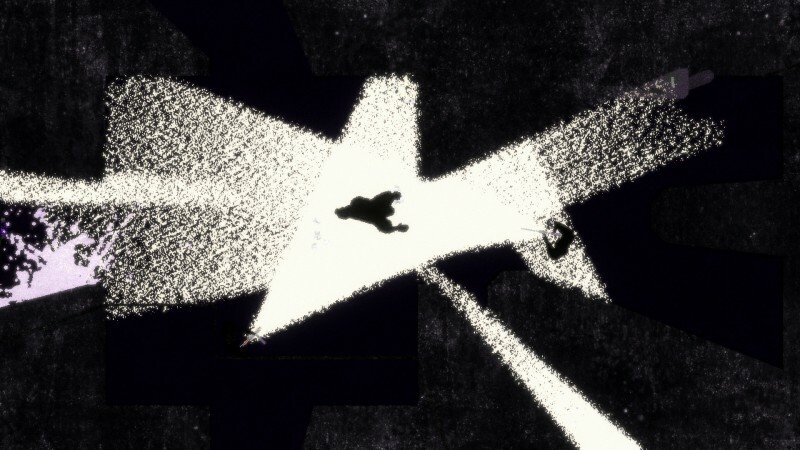 Though Ape Out’s basic functions appear simple, it has a lot of leeway for creativity and strategizing. The men trying to contain you are initially just soldiers armed with rifles, but as you progress, you run into different kinds of commandos with their own dangers and benefits. For example, attacking the grenadier head-on makes him explode, killing you both. However, if you grab him, you can throw him into a group of foes like a bowling bowl and kill all of them with the ensuing explosion. 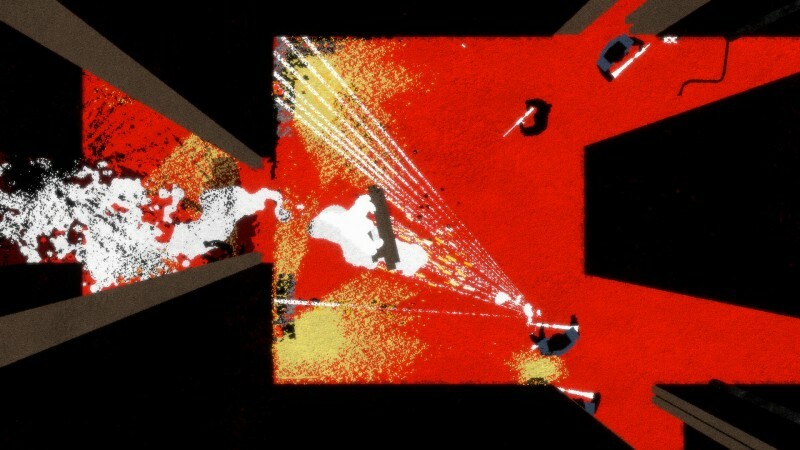 Every new collection of levels in Ape Out (presented as albums, with each individual level being a track) takes place in a new location that also introduces obstacles and advantages. 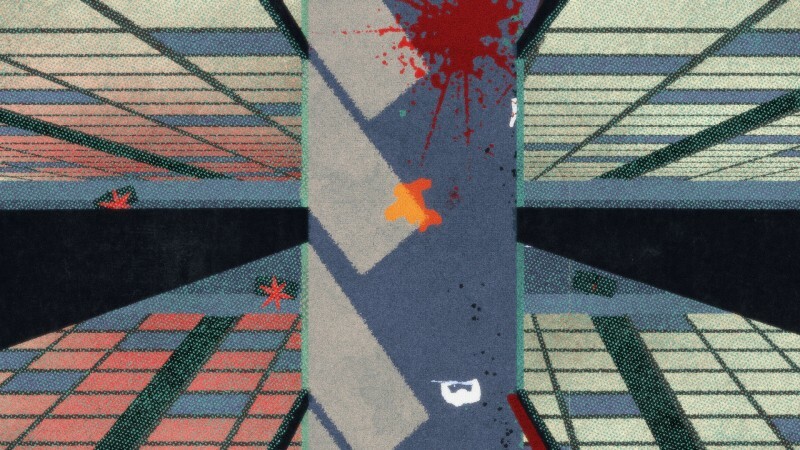 The second collection’s setting is a high rise where you can quickly whip enemies to their doom by tossing them out the window, but snipers across the street blast you if you stand too long in one spot. 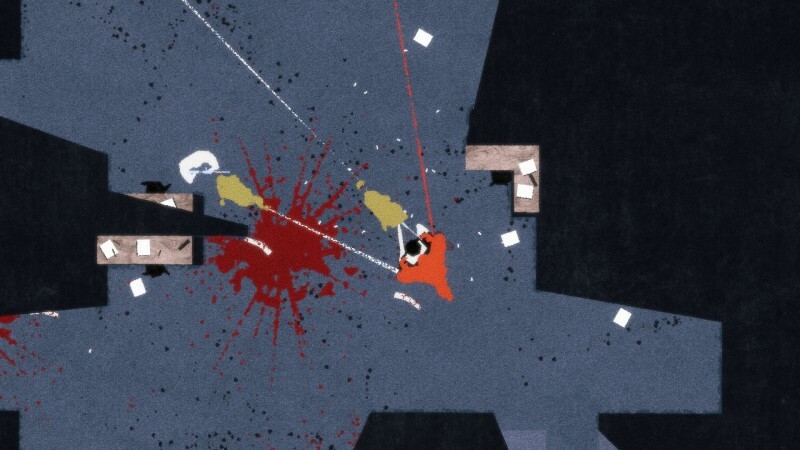 The consistent introduction of dangers and tools to create havoc makes Ape Out a finely tuned experience. I was constantly amused by the scene changes as well as the challenges presented to me and how I overcame them. 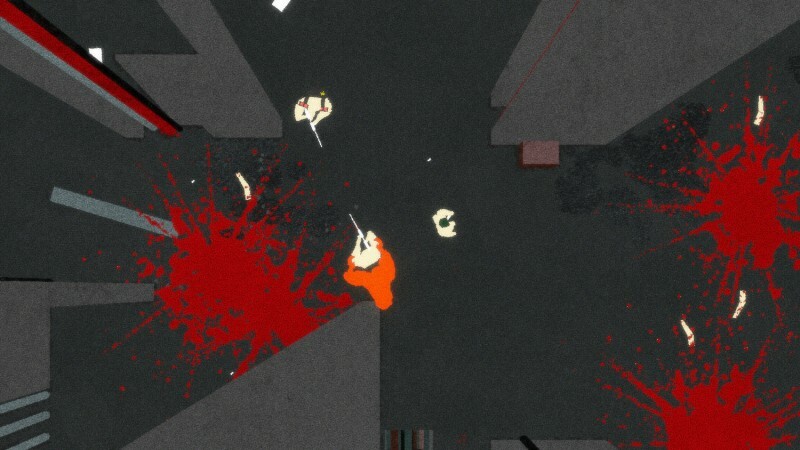 I died a fair amount of times, but Ape Out is generous, allowing you three hits from an enemy before you go down. That gives you ample opportunity to learn their A.I. patterns and develop strategies for overcoming them. My only complaint is that certain deaths feel unfair, especially when an enemy off-screen has killed you, but those moments are few and far between. 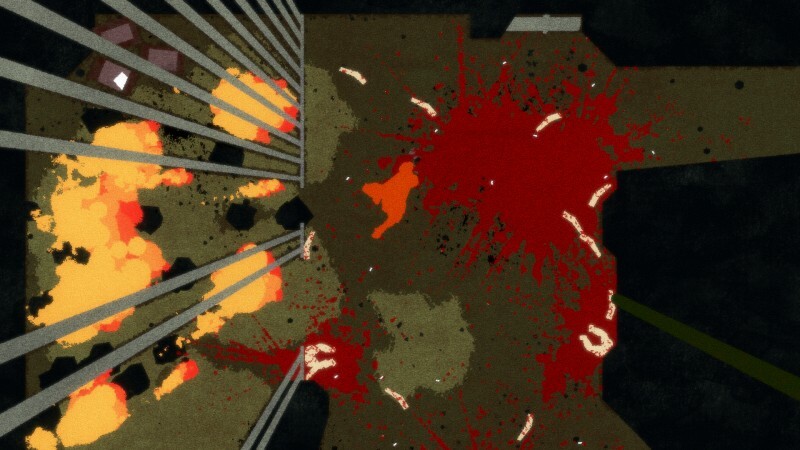 The gorgeous stylized art as well as a soundtrack that creates a beat to your action in the game (banging a drum when you kill foes or blaring a horn when you rip off doors) also makes restarting levels after dying not that big of a deal since it’s just so enjoyable to play through them. The sound design is particularly satisfying, with the user-created soundtrack propelling forward the action in a lively way. I played through Ape Out in single sitting (which took about two and a half hours), and I thought it was the perfect length for this sort of experience. The campaign levels also have arcade-mode and hard-mode variants for those who want to test their mettle as a fragile gorilla, so there’s plenty of ape-smashing content if you can’t get enough. Ape Out gloriously celebrates its simple, splattery premise with creative gameplay that I can’t wait to return to in the near future.